The Beef Eater Crown has a 4" D2 Tool Steel hefty blade. Overall length approx. 9 1/2". 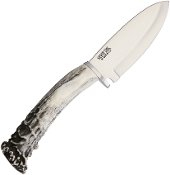 Crown Burr antler handle with stainless finger guard. D2 has a rockwell of 62 and will stand up to heavy field use. Leather pouch type two way sheath can be worn vertical or horizontal. Made in USA. Lifetime Warranty. Resharpening/refurbishing service provided by the manufacturer.